We haven't run a piece on police misconduct and corruption in a while. The stories are too numerous too deal with. They need their own channel just to keep up with them. 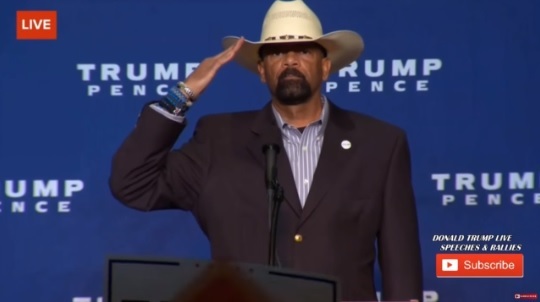 But this is what celebrity Sheriff David Clarke who Trump wants to appoint to the Department of Homeland Security has been up to. There many be a bigger piece of s*** in uniform, but I can't think of one off hand. He KNEW his deputy ran a stop sign, severely injured a young woman and then kept up false charges against HER for driving while intoxicated for months which he knew was false until surveillance video - which Clarke knew existed - was found and proved her innocent. The people of Milwaukee are going to be forced to pay millions to compensate this young woman - and she's more entitled to it after what they animals put her through. Why isn't Clarke and everyone else involved in this cover up in jail over this? He clearly directed the operation; condoned, if not directly ordered perjury; withheld evidence; and knowingly participated in a fraudulent persecution of an innocent person. If he didn't do it, why hasn't he found the sub-commander who did and brought him up on charges? This is a profoundly sick department and the only way it could have gotten this bad is if it were run by a profoundly sick individual. And now - like all scumbags - he's on his way to a top job at the Department of Homeland Security.